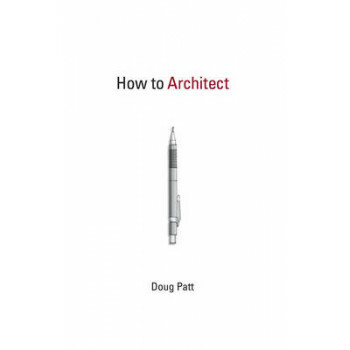 The word "architect" is a noun, but Doug Patt uses it as a verb--coining a term and making a point about using parts of speech and parts of buildings in new ways. Changing the function of a word, or a room, can produce surprise and meaning. In How to Architect, Patt--an architect and the creator of a series of wildly popular online videos about architecture--presents the basics of architecture in A-Z form, starting with "A is for Asymmetry" (as seen in Chartres Cathedral and Frank Gehry), detouring through "N is for Narrative," and ending with "Z is for Zeal" (a quality that successful architects tend to have, even in fiction--see T he Fountainhead's architect-hero Howard Roark.) How to Architect is a book to guide you on the road to architecture. If you are just starting on that journey or thinking about becoming an architect, it is a place to begin. If you are already an architect and want to remind yourself of what drew you to the profession, it is a book of affirmation. And if you are just curious about what goes into the design and construction of buildings, this book tells you how architects think. Patt introduces each entry with a hand-drawn letter, and accompanies the text with illustrations that illuminate the concept discussed: a fallen Humpty Dumpty illustrates the perils of fragile egos; photographs of an X-Acto knife and other hand tools remind us of architecture's nondigital origins. How to Architect offers encouragement to aspiring architects but also mounts a defense of architecture as a profession--by calling out a defiant verb: architect!